Hearts reach out to a world in need. 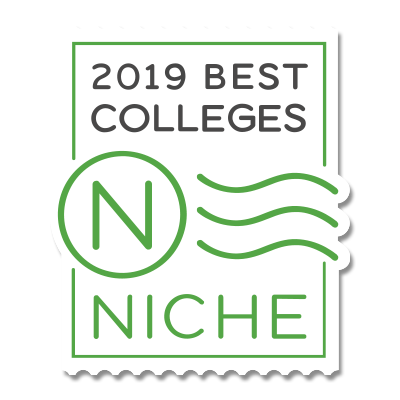 Elms College lives this charism through our core values of faith, community, justice and excellence in an effort to manifest change in the world and in our lives. All are welcome on the journey to unite with us in responding to the world. We provide experiences of faith formation, spiritual exploration, cultural awareness, and educational experiences that are reflective of Elms mission. We challenge you to look closely at how you interact in classes, at jobs, in relationships, in the community and the world. The goal of reflection is to find the spiritual underpinning in a lesson or an idea and to leave yourself open to a change of attitude or action in your daily life. In short, we journey with each other, transforming into better versions of ourselves. Two Elms students spent a week in France in June 2018, practicing their French, learning about French history and culture, and — perhaps most importantly — making personal connections with the legacy of the college’s founders, the Sisters of St. Joseph. 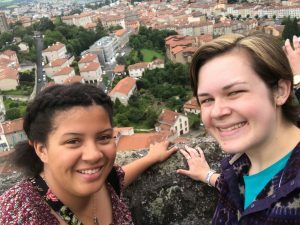 From June 16 through 23, Monica Karriem ’20 of West Hartford, CT, and Jane Dugan ’20 of Southwick, MA, joined a pilgrimage to Le Puy, France, led by the Association of Colleges of Sisters of St. Joseph (ACSSJ). Read Jane and Monica’s full story here.